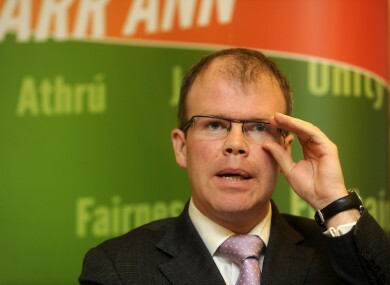 Peadar Tóibín says he cannot support the Protection of Life during Pregnancy Bill. GERRY ADAMS HAS said it would be a serious breach of party rules if any Sinn Féin TD voted against the party’s position on the proposed Protection of Life during Pregnancy Bill. He was speaking after the party’s Meath West TD Peadar Tóibín said that he could not support the bill that will legislate for the X Case ruling. “I’ll be voting against this legislation, I have to say,” he confirmed to RTÉ’s Prime Time last night. Describing supporting the bill as “an impossible ask”, Tóibín said it would be a “radical change” from the current legal position and said the issue was bigger than him. “Any problems that I face over this pale into contrast with the difficulties mothers face and unborn children will have,” he claimed. In a statement issued before Prime Time was even over, Adams said that Sinn Féin’s position on abortion issue is clear and was reiterated at the party’s Ard Fheis. “The government needs to legislate in line with the X Case to protect pregnant women when their lives are at risk and to give legal certainty to medical practitioners,” Adams said. He said that all party representatives will be mandated based on the decision of the party’s Ard Chomhairle – which is expected in the coming days – on how to vote in relation to the legislation. Tóibín has previously called for a free vote among the Sinn Féin parliamentary party and has already incurred the wrath of party discipline after he failed to turn up for a vote on a Private Members’ Bill that would have legislated for the X Case last year. That decision meant he lost the chairmanship of the Oireachtas Investigations Committee. He said last November that the Supreme Court X case – which gives a woman the right to have an abortion in circumstances where her life is at risk including from suicide – as “historic and archaic as a case”. Email “Gerry Adams issues discipline warning as one Sinn Féin TD rejects abortion law”. Feedback on “Gerry Adams issues discipline warning as one Sinn Féin TD rejects abortion law”.